Traditional Vietnamese Egg Coffee is a drink that you have to try while being in Vietnam. I am sure that it will blow your mind. 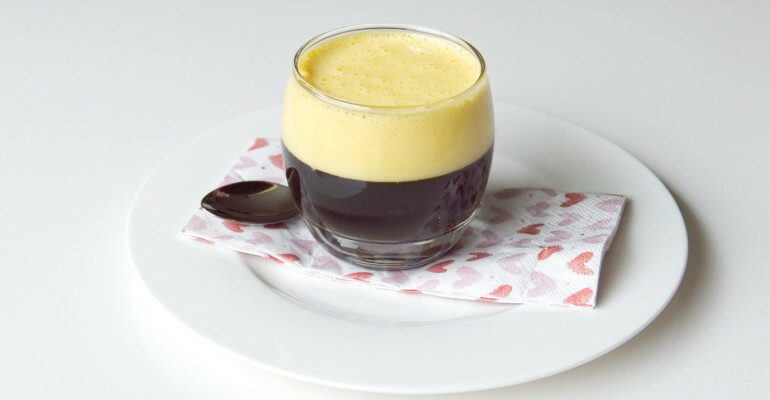 The combination of strong black coffee and creamy sweet egg-cream is mouthwatering. It is one of the best coffees I have ever had in my whole life, and I am so glad that we brought this egg coffee recipe from Vietnam home! Vietnamese Egg Coffee is traditionally prepared with egg yolks, condensed milk, sugar and robusta coffee beans and was invented when Vietnam was scare of milk. The first time we have tried the traditional Vietnamese Egg Coffee in Cafe Giang in Hanoi, and we immediately fell in love with it. Cafe Giang has many different variations of this coffee – apart from the regular one we also loved the one with rum. My husband who isn’t a coffee lover tried their egg hot chocolate which was also very tasty! 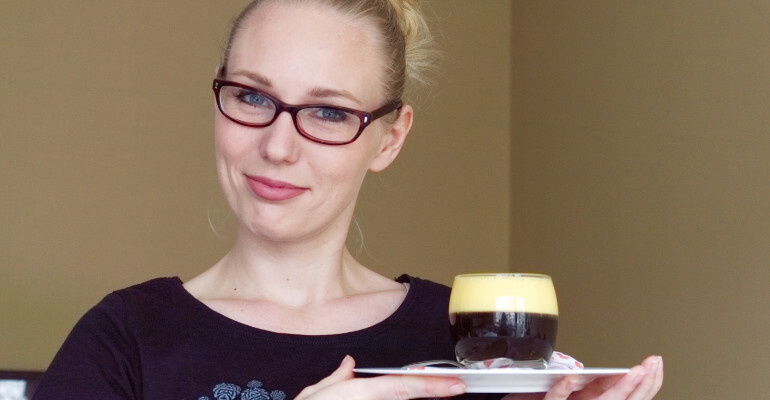 On this trip to Vietnam, we were lucky enough and learned the Egg Coffee recipe on the cooking classes. To make the Egg Coffee the traditional way you need Vietnamese coffee filter and several minutes, but trust me – it’s worth the effort! In my opinion it could be also served as a desert, after a large meal, when you don’t have space for a cake but still want to have something sweet. Please check out our recipe and the video below! Boil the water in a small pot. Put the coffee in the filter, pour some hot water and wait 10-20 seconds. After this time you can fill up the filter with the rest of hot water. It takes 5 minutes for the coffee to brew. Pour the cream over the coffee and enjoy it. Add milk, if you don't like black coffee! The egg coffee can be served hot or cold. The egg coffee should be consumed freshly, so as soon as you are ready with the peperation. For this recipe I advise you to use organic egg yolks, as you consume it raw. Some mixtures after whisking might change the color to more white, but because I used organic German egg yolks, that were very yellow it didn't happen in my case. For your convenance you should also use the stand mixer if you have one - it is pretty tiring to whisk for 20 minutes. If you don't have robusta coffee beans please use a normal coffee. The coffee and the egg mixture don't mix well together so if you don't like black coffee, you can add also milk to it. You can modify this recipe by adding a bit of alcohol Od you choice to the egg mixture, or even replacing coffee with the hot chocolate. I am sure that the egg coffee would taste amazing also cold so please experiment with it and when you have any other suggestions please let me know down below! If you are interested in Vietnamese food please check our latest video, that shows the Street food dishes that we have eaten in Hanoi. The addresses of the stalls you will find in the video description and in the following blog post: 6 dishes that you need to try in Hanoi. Are you crazy about sweet dishes from Asia? Here is another recipe that you should check out: Traditional Thai Mango Coconut Sticky Rice.